It seems anything you do or anywhere you visit is worthy of a selfie, whether that’s standing on the edge of a cliff or going for a coffee. But a new study has revealed our need to capture the perfect selfie comes with a price — the price being 250 deaths. The study published by the Journal of Family Medicine and Primary Care investigates how many of us social media addicts are dying to feed our Instagram. The rise of the “extreme selfie” phenomenon involves photographing yourself “in the most extreme environments. That apparently includes river rafting, parachuting, or posing in front of oncoming trains — yes, really. The study spotted just five selficides reported between 2011 and 2013, but as social media grew and just about everyone owns a smartphone with a front camera, in 2017, 93 deaths were caused by selfies. According to the study, there are eight main causes of death by selfie. 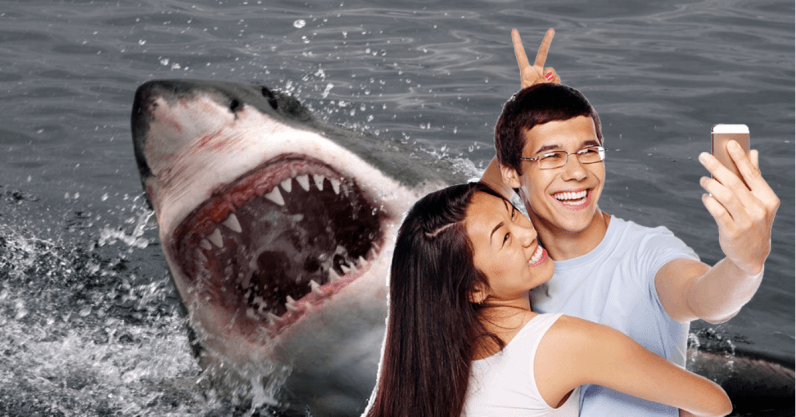 The most common selfie-killing scenario, that has claimed 70 lives in six years, is drowning — either falling into a large body of water or being swept away by waves. Other deaths included posing on the edge of a cliff and falling, accidentally shooting oneself when posing with a firearm, and attacks by animals. While the study found a quarter of the selfie-related deaths were just unfortunate accidents, the rest were down to dangerous and reckless behavior. The researchers broke down the geography of the recorded deaths and found the highest number of incidents were in India, followed by Russia, the United States, and Pakistan. How can we stop murderous selfies? Even though the answer should be pretty simple — don’t pose in front of oncoming trains — the study suggests an idea to bring down death rates caused by selfies. By implementing “no-selfie zones” in dangerous areas, this could remove the temptation of capturing a life-taking selfie. I’m sure the selfie-chasing millennials out there will not pay attention to a “no selfie” sign at the edge of a cliff — surely it’ll encourage them even more? I mean, if they’re already willing to risk their lives for a few likes, I bet they couldn’t resist the engagement they’d receive on a selfie of them hanging off a cliff holding a “no selfie” sign.